Adopting cats is exciting and potentially stressful. It is exciting for the new cat parents and stressful for the cat. 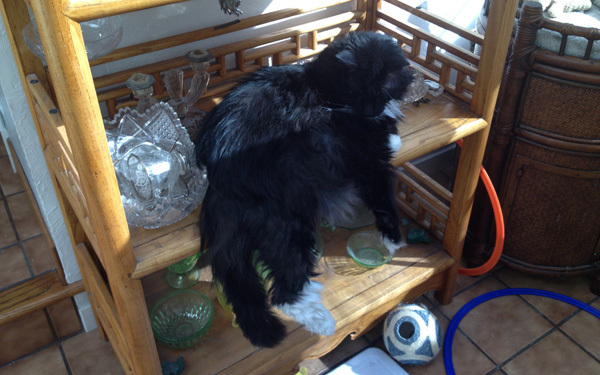 As a rule, cats do not adjust readily to change. New environments with their own sights, sounds, and smells are frightening. Cats come with their own histories. Some lived their lives in comfort, bonded to a special someone or someones. These kitties do not understand why their lives dramatically changed — people and places they loved and knew no longer exist. Cats from rough outdoor lives have a different set of challenges. They have to adjust to a new way of life where they do not have to fight for their meals or compete for protected places to nap. 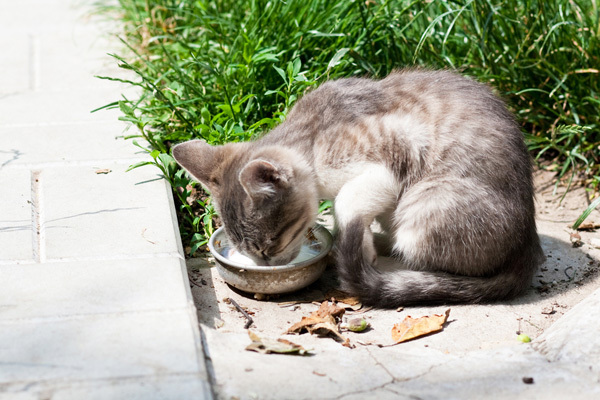 It is not surprising that cats become anxious in their new homes, taking up residence under beds and couches, venturing out only for a quick bite of food when no one is around to spot them. Your job is to help your new little companion feel secure while she adjusts to her new world. You can minimize the stress by preparing a special space just for her. Here are some tips to help you transition the newcomer. Newly adopted cats need time and a place where they can feel safe and start making sense of their new environments. Your newcomer needs her own room that will be ready for her when she arrives home. This space will become her private sanctuary, a refuge, free of other household animals. It is a place where she can start feeling secure and bond with you and the other human household members. The room should be large enough that it easily accommodates litter boxes, vertical territory, scratchers, boxes to hide in, food, water, toys, and comfortable places to sleep. Choose a room where you and other household members have enough space for socializing and playing with her. A bedroom is a good choice because you can spend nights or nap with the newcomer. Shy cats often feel a little more secure at night and will check out their people while they sleep. Ideally, the room should have an escape-proof window. The window will provide your new kitty hours of entertainment while she watches the goings on in the neighborhood. Make the space safe. Place dangling cords and objects out of reach or secure them with cord windups. Remove breakables and objects that might be swallowed. Customize her room. If you are fortunate enough to know your new little cat’s previous owners, ask them to donate her favorite items. Familiar smells, tastes, and textures will help comfort the adoptee and make the transition a little less stressful. Lay in a supply of the food and treats she enjoys along with the same brand of cat litter she used in her old home. Favorite blankets, beds, toys, cat towers, and scratchers should accompany her to her new home. In a perfect world, her litter box will be part of her gear, along with a small plastic bag of her used cat litter. 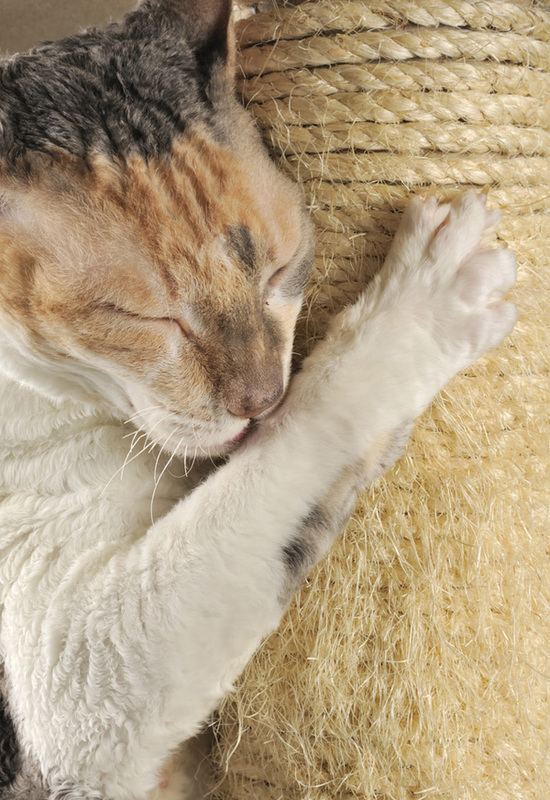 Adding the used, familiar litter to the litter box will help her feel a little more at ease. Not all cats show up with their own care packages. Cats often have rough beginnings with unknown histories. Some come from rough areas, others from shelters. Cats from the hood travel light, with no luggage. 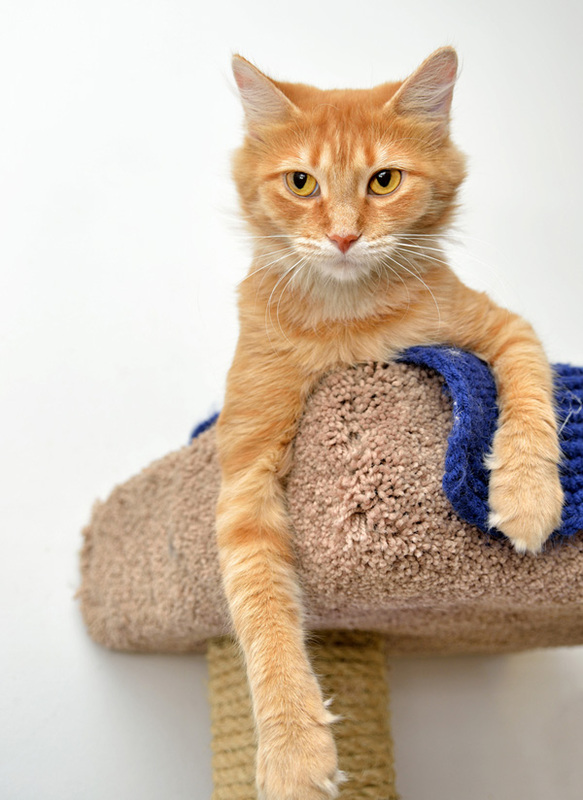 Shelter cats may come with a minimum of accouterments that include food, treats, and a few toys. 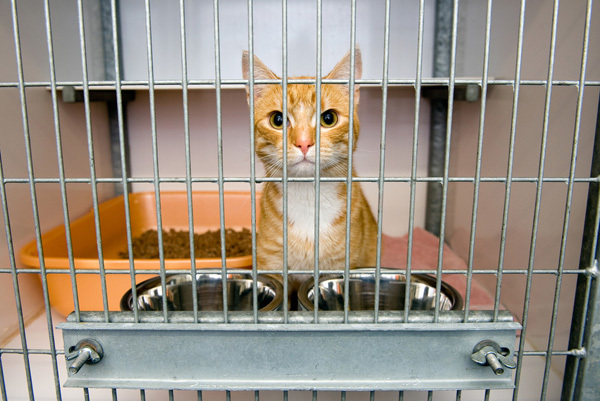 Many shelters pay attention to environmental enrichment and hang cardboard scratchers inside the cages. Often they allow adopters to take them home. When outfitting a cat room from scratch, buy new. 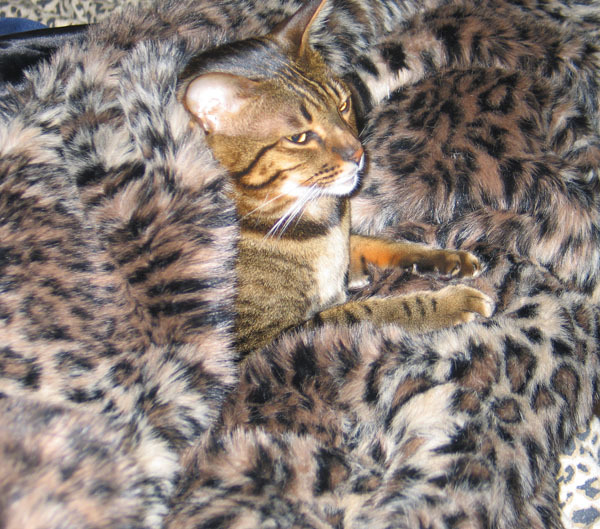 Do not use inherited cat furniture, toys or scratchers that another cat or dog has used. Scents from other animals stress newly adopted cats who are already anxious about the change of venue. The sanctuary room is the perfect place to socialize and start bonding with your new little companion. You might find that she takes up residence under the bed. Or she might be brave — thoroughly checking out her new world and you the moment she ventures out of her carrier. Whether she is shy or brave, do not force your attentions on her by trying to pick her up or petting her. Instead, earn her trust. Every time you are in her room, make good things happen. Give her food and treats she loves so that she associates you with something she enjoys. If she loves to play, then engage her in games, using pole toys and soft toys she can chase. Shy cats who hide can be helped along by sitting on the floor a distance away. Bring a book with you and read to her. Playing classical piano recordings at low volume might help reduce her stress as well. Instead of approaching the newcomer, encourage her to come to you by formally greeting her. Extend your index finger toward her, at cat-nose level. When she is ready, she will come up to your finger, sniff it, and then turn her head so that your finger is on her cheek. At that point, you can start petting her under the chin, on the side of the face, and back of the neck. It is hard to judge how long it will take until your new cat is ready to venture into the rest of your home. It might be within a few days of arrival, or it might take weeks. She will let you know a number of ways, including vocalizing and hanging out near the door. When it is time, open the door, allowing her to venture forth when she feels brave. Make sure that the door remains open to her room so that she can run back to the safety of her refuge if she feels frightened. If there are other resident animals, keep them separated from the newcomer and gradually introduce them to her. What Do You Do When Your Cat Shows Signs of Senility?